Do you find your mornings a bit completely rushed? Is the feeling of running late all-too-familiar? Do you scramble out the door with your hands full, a giant travel mug of coffee balanced precariously in the crook of your elbow, and a half-eaten bagel in your mouth? (Perhaps you’re lucky to have even toasted that bagel at all…) If you answered “yes” to any of these questions…you might need a morning routine. Alternatively, do you have a difficult time getting started in the morning? Do you ever feel unmotivated or disinterested? Are you missing that “get up and go” drive? If you answered “yes” to any of these questions…you might need a morning routine. In fact, I cannot stress enough the importance of maintaining a consistent morning routine; alongside getting a restful night of sleep, following a morning routine is critical to ensuring a productive day. Really. It makes all the difference. By beginning your day with things you enjoy, be it gentle stretching, taking a hot shower, going for a run, or sipping coffee from your favorite mug, you’re starting your day on a positive note. And the benefits don’t stop there! Following a morning routine sets you up for a day of peak productivity. How? When you follow a morning routine, you accomplish several tasks before the “real day” even begins. This feeling of achievement first thing in the morning strengthens your motivation and gears you up for your day ahead. Need proof? How about this – one of the reasons soldiers make their bed each morning is because it provides the opportunity for a small achievement before the day even starts. Let’s think about this for a minute. If simply making your bed creates a small sense of pride, which leads to bigger and bigger accomplishments, just think how great you will feel after completing your daily morning routine. Heck, you’ll be ready to take on the world! What kind of morning routine do I need? Now, I am well aware that morning routines differ widely from one person to the next. A stay-at-home-mom of 11-month twins has a much different morning schedule than a senior in college finishing her student teaching. And both of those women have a markedly different routine from the doctor at Children’s Hospital with two kids in high school. 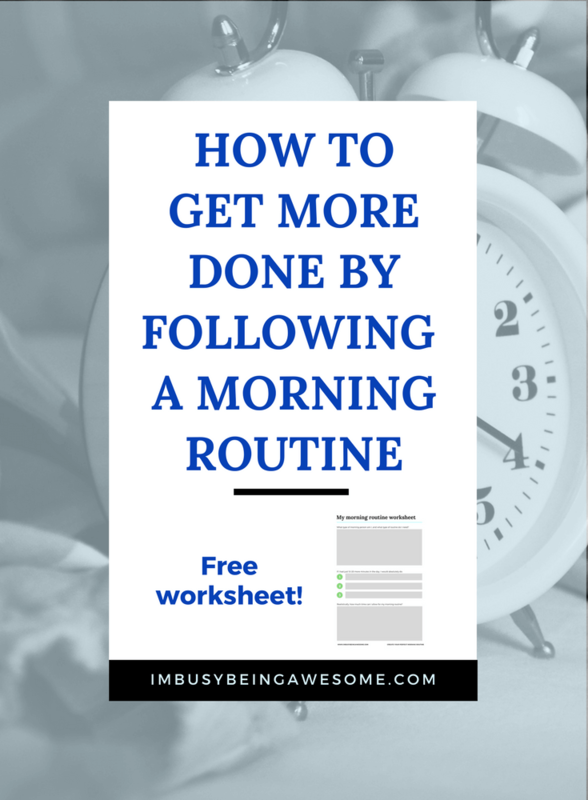 So rather than simply sharing with you my morning routine (I’m sure many of you would pass on the 4:20 wake up anyway…) I’m providing you with the tools to develop your own ideal morning routine. 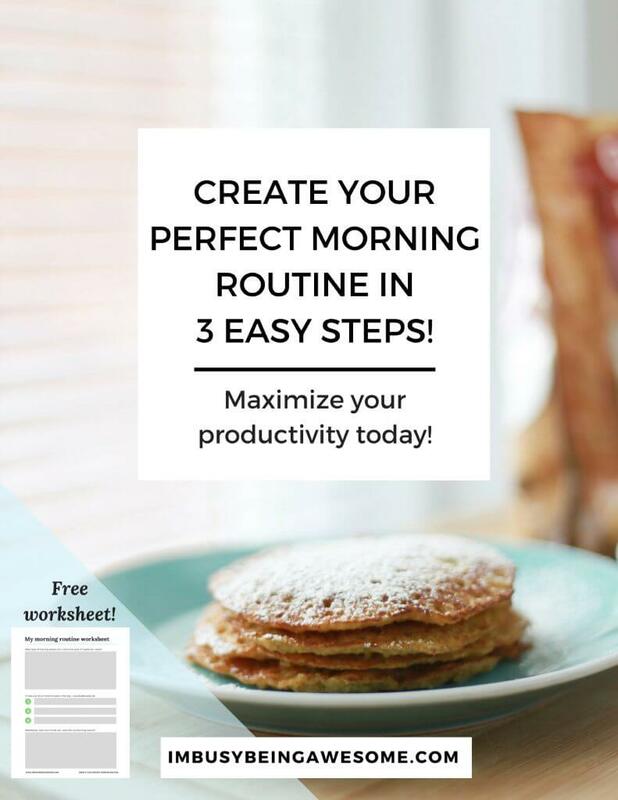 I’ve created a free worksheet that guides you through the process, and I’ve offered several different suggestions for activities you might include. Are you ready to start your day off right? Great! Then read on. 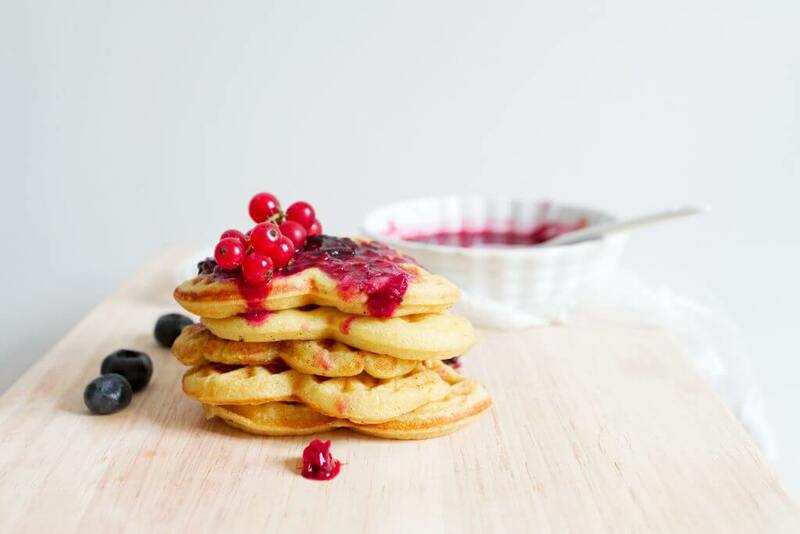 First, start your day well-rested. Believe me, I know getting enough sleep is a challenge for many people – I’m often struggling to get in the hours myself. But it’s amazing how much better your day is when you’re well rested. So guideline number one, push yourself to get to bed on time as often as possible. I’m working toward that goal right there with you. Second, leave yourself more than enough time to complete your routine. Another major benefit of following a morning routine is that you’re taking time first thing in the morning to do what’s important to you. If you don’t leave yourself enough time, however, those once-enjoyable activities will feel more like tasks on a “to-do” list. This completely defeats the purpose. By overestimating the time you need by about 10 minutes, you have a little wiggle room for when the unexpected (inevitably) arises. p.s. 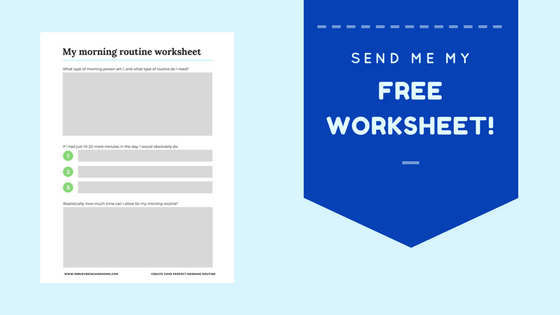 using my FREE worksheet will help ensure that you manage your time well. Are you a person who wants a peaceful, relaxing wake up with gentle meditation, 10 minutes of reading while sipping a cup of coffee, followed by some light stretching? Or are you a person who wants to jump out of bed directly into your gym clothes, head straight to your early morning class, and follow up with a hot shower, a fresh cup of coffee, a bowl of oatmeal, and 15 minutes of blogging? (That’s my routine, by the way).By answering this very basic question, you are on your way to creating a routine that’s perfect for you. There’s no sense in forcing a routine that doesn’t add value to your day, because then you’re just wasting time. Think about what you want to start your day off right. It’s often those little moments of “me time” – reading, journaling, meditation, yoga – that are the first to go when your day fills up with “must-dos.” What do you miss the most on those busy days/weeks/months? What would add value to your life if you did them again? Choose 2-3 things, and include them in your routine. 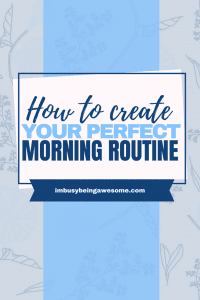 If your normal morning is a 30-minute frenzy packed from the moment you get out of bed to the moment you get in the car, you probably shouldn’t create a morning routine that’s an additional 30-40 minutes long. It’s just unrealistic. Keep the time frame reasonable so you actually fit it in. Once you’ve answered the above three questions, then start planning your morning routine! Next, figure out how long each of these activities will take. Then, working backward from the time you need to “begin the day,” decide what time you need to wake up. Finally, add an extra 10 minutes for wiggle room. Are you looking for ideas to include in your morning routine? Don’t worry, I have you covered! Here are 25 ideas, divided into five categories, including: waking up, mindfulness, organize, physical activity, and nourishment. So tell me, what’s on your morning routine? Let me know below! By the way, did you grab your free worksheet? Get it here, and start planning your routine today! It’s funny, bc I have no problem getting up early so I could theoretically execute a routine – but I never actually do. Definitely going to change that. I need to get more sleep for sure! We are always so rushed in the mornings. It would help if I made the kids’ lunches the night before. Great recommendations for starting off the morning in a positive way! Yaaas, girl! I lovelovelove this! I’m always more productive and feel ready for the day when I get enough sleep and get up early enough to ease into the day, instead of rushing around in the morning to get ready. Thank you so much for these great tips! This is my first week as a stay at home wife/blogger, so establishing a routine is very important to me right now. I’ve been having a tough time planning it and sticking to it so these tips are just what I needed! I really want to implement a morning routine. This is a nice little formula! Very helpful. My husband and I have morning routine each day. Because if we don’t it goes crazy . We always get up early, thank God for another day . Then my husband make coffee and I make our breakfast . Morning routine is very smart to have. I need to try adding some of those 25 things to my morning. I definitely don’t get the 7-8 hours I should! This is so helpful! I love the worksheet you created! It’s so helpful in getting my morning organized! Great post! Having a morning routine definitely helps a SAHM like myself. I get more accomplished in the morning than I do in the evening. I bet! When I work from home I definitely need a clear routine, otherwise it’s WAY to easy for me to get distracted. Having a well thought out and planned morning routine is so important. A little over a year ago I started waking up at 5am so I could get a quiet and productive start to my day, and it has made a world of difference. That’s fantastic! It’s amazing how much a little quiet time can do, isn’t it? I am not a morning person so I have to be extra prepared before the sun hits me. These tips resonate so much with what I do to stay ahead and productive. Great share. That’s great – I hope they help! Yeah – that snooze button is a tough obstacle! Haha. I wake up at 6 to work on my blog and drink my coffee, then at 7:30 Its time to get my little guy ready for kindergarten. Setting any routine more than feeding my toddler, getting her dressed and dropping her at preschool is difficult. Your tips are great and I will work on planning a workable routine for myself. I bet! Any time children are involved, routines get a little more challenging. I hope you’re able to get something in for yourself, too! Morning routines are definitely SO important. I used to literally wake up the last possible second that I could, and it got kind of crazy. I have seen the importance of routine even more now as a working mom with a 7 month old. I get up early and get cracking on my day, but getting my preschooler up is another story! Normally, I cannot contain her energy, but on school mornings it is like her feet are stuck in molasses. We have been getting up earlier to allow for the sticky feet and going to bed earlier, too. It is helping! I love your making the bed tip. That really makes a difference! It is so true! It is helping though! So important to find a routine! Thanks for sharing! I have been trying to implement a REGULAR morning routine. I can definitely tell the difference from the days I do it from the days I don’t. It’s amazing how much it makes a difference. 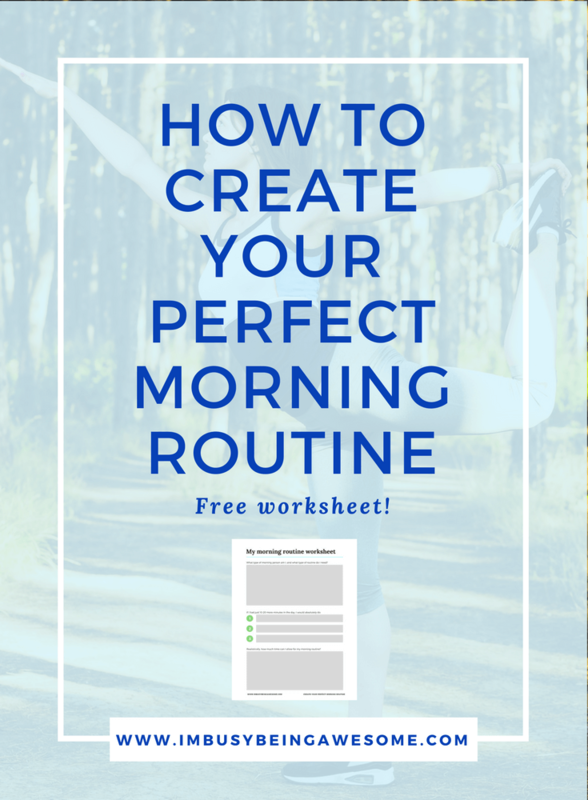 I love your printable worksheet to help really plan out the mornings. Very helpful! I also love what you included about making the bed. I am NOT with you on waking up at 4:20 every morning 😉 Sorry mama! It makes such a big difference, doesn’t it? I’m glad the worksheet is helpful 🙂 And I don’t blame you – there aren’t many people who think 4:20 a.m. sounds like a good idea ;). I so want to have a morning routine! If I could only wake feeling well-rested. Am going to work on that…I am, I am. Thanks for the motivation! You can do it! Set an alarm to get to bed on time – it will help you feel rested when you wake up in the morning 🙂 I wrote a post on bedtime routines last week – check it out if you want any more tips! I love this. Morning routines are SO hard, especially with babies… Thanks for the reminder to put myself first! You make some good points. I make the kids make their beds in the morning but i never make mine. 🙈 need to start. I’m not much of a morning person so I really need to work on getting into a good routine. Thanks for sharing these tips! These are great. I’m going to work on planning today. Such a helpful tool!! I have been re-establishing my morning routine now that I teach online first thing in the morning. I could try to get to the cozy chair to have a sip of coffee and read my devotion first, but knowing myself, I also know it’s never going to happen. So now I give myself 9 minutes to just sit in the shower while I eat my breakfast and take in a short breather before starting classes. Then when I am done teaching at 10 I try to find another minute to get some “me-time” in!